Formation : Large circle for sets of one man with a lady on either side, facing anti-clockwise around the dance-floor. A1 Man takes both hands with right-hand lady and gallops 8 steps anti-clockwise, then back to place. A2 Repeat with left-hand lady. 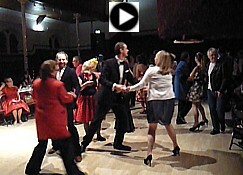 Men move forward to the next two ladies to start the dance again.